In August 2016 the Fundraising Regulator published proposals for the FPS. One of our biggest concerns is the lack of definition over the key phrase 'fundraising communication'. You can find our full response here. 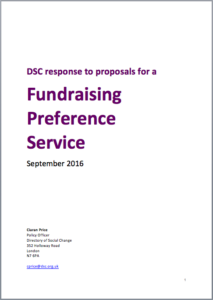 The Fundraising Preference Service (FPS) has been the most controversial proposal to emerge from the review of fundraising regulation led by Sir Stuart Etherington in September 2015. The review was undertaken to resolve a perceived crisis in fundraising, which was sparked when the Daily Mail falsely linked the death of a charity supporter to a complaint they had made about the volume of direct mail being received. During this time, media reporting on charities was highly misleading and unfair but it also highlighted some shortcomings including the sale of supporters’ data and the practises of some private fundraising agencies. The FPS was proposed as a means of allowing individuals to have greater control over how they can be contacted for the purpose of fundraising.